1. What is the capacity of a water/petrol tanker, or a tanker carrying milk? 2. How to measure the heap of grains/sand stacked on the floor, against wall, at the corner of wall? 3. What is the requirement of paint to paint a pillar? 4. How much cloth is required to cover a tent? 5. What is the volume/mass of earth? In your daily life you must have come across objects like water pipes, iron rods and Road roller. 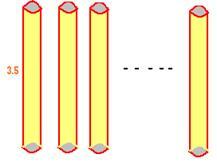 They are all cylindrical in shape. They may be hollow like pipes, or solids like rods and road rollers. They all have circular planes at two ends. In the figure given below, AB is the axis of cylinder. PQ is the height of the cylinder. 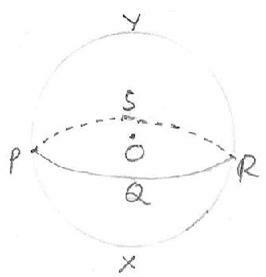 AP and BQ (AP=BQ) are the radius of the two circular planes. if we spread across, we get a rectangle similar to ABCD. Breadth of the rectangle is equal to the length of the cylinder (AB=h). For easy calculation we use approximate value for =22/7 in all our problems. surface of the pillars at Rs 25 per Sq.meter. revolutions what is the area of playground? 6.15.1 Problem 3: A Petrol tanker is made of sheet metal. 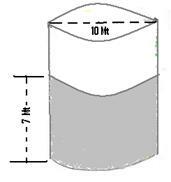 If the tank’s length is 2.6 meters and the radius of the cylindrical tank is 140cm. How many sq meters of sheet metal is required to make the tank? The heap of grains, heap of sand, ice cream introduce us the concept of cones in our daily life. 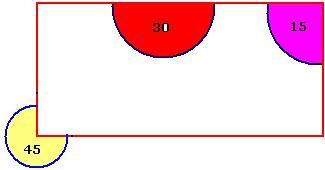 If we cut a cone along the edge and spread across, we get a sector of a circle as shown below. 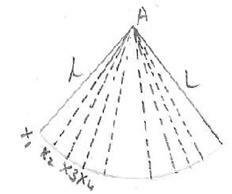 The section (APQ in the figure on the left) is formed by an arc of radius equal to slant height l of the cone. as shown in the figure on the right hand side. they tend to become straight lines when the circular section APQ is divided into small portions. They form the base of small triangles. We need to find the curved surface area. 12 meters. How much sheet metal is required? 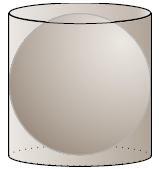 volume of a cylinder is equal to three times the volume of the cone. from that, cones of radius 1cm and height 2.1 cm. How many cones can he produce? 6.15.2 Problem 4: A heap is farmed when a farmer pours food grains on a ground. The slanted height of heap is 35 feet. The circumference of the base is 132ft. He sells the food grains based on the volume. Name the solid formed and find the volume. The heap formed is of cone shape. We are required to find the volume of the cone. We are given circumference of the base and its slant height. In order to calculate the volume We need to find the radius and the height. 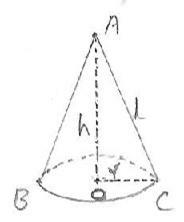 The slant height is the hypotenuse of the triangle formed by the radius as the base and height. 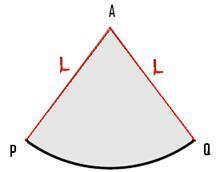 R,H,L and that of small cut off cone be r,h,l respectively. The heap is of the cone shape. The base of the heap is part of a circle and hence we need to find the radius. The height of frustum is 5cm. compute its volume. Let the height of larger cone and smaller cone be H and h respectively. 1. Sphere has a centre. 2. All the points on the surface of the sphere are at equidistance from centre of the sphere. 3. The equidistance is the radius of the sphere. 4. A plane passing through the centre of the sphere divides the sphere in to two equal parts called hemispheres. Cost of painting = area*rate = 308*200 = 61,600 Rs. Who has not heard of water melon which is rich in Vitamin A, C , Iron and Calcium. Have you observed how a vendor cuts a water melon before you decide to buy one? He makes an incision and cuts through the water melon to take a piece out(cone shape) similar to what is shown in the adjacent figure. We shall introduce similar concept while working with sphere. The sphere can be concluded to be consisting of small cones of height equal to the radius of the sphere with circular base as can be inferred from the adjoining figure. the sphere is four times the volume of the cone. Note, the water spilled out is equal to volume of shot-put. is they are all hollow and have one internal and another external curved surface. Cross section can be thought of as the area of a circular plane = r2 = 2sq.cm. 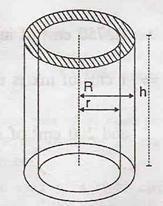 This can be thought of as the volume of water collected for 5 minutes in a pipe of length h whose cross section is 2sq.cm. the water emerging at 3.2mts/sec. How long does it take to fill the tank? 2. Calculate the volume of water flowing through a pipe of circular plane area of 1.5sq cm in one minute at 3.2mts/sec. of the pipe if 1 cubic cm of metal weighs 7.7gm.